Hey Andrew Nice shooting w ya today! You got a pic of that orc? Nice aces andrew! Now get one at states. I'd like one at ledgestone too! For sure I forgot you were going there looks like ya got some spending money now have fun. Nice win last weekend! Go Team Discraft! heck yeah! awesome play this weekend. go team Discraft! Nice job you beast beating up on 90+ players! How much did you win? 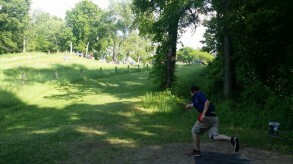 WOW nice ace out there in minnesota!! Congrats kid, you will serve them well!!!! I see more sponsors in your future. Keep up the good work!!! ill settle for 7th. was a fun weekend! You tied for 6th and it was a fun 2 weekends! Now i need a rest. you got 6th place you should have gotten the stand up trophy for shooting that hot round. not a throw off over a pivilion cause they wanted to do a hour of lizard games we would have had plenty of time to do actual throw offs if they didnt waste time for lizard games. booooooooo good shooting this weekend. Your awsome. Nice shooting w you at the DGLO. Good luck today you beast! Heck yes dude solo 10th out of 62 in open. Hey Andrew one day people will want to buy the disc with your name on it. Keep it up. Nice Shooting, Andrew! Afternoon tee time! Good luck today! nice shooting Andrew....best of luck tomorrow. My favorite was him hitting the pin on7 with his 2nd shot. Ho needs am nats if you take big $ against the best in the country/state? Keep it up kid! Rooting for you!